Tunisia is one of the most popular tourist destinations in North Africa, and for good reason. It offers spectacular beaches for those in need of relaxation, and several diverse cities with ample opportunities for shopping and dining. Most importantly, though, Tunisia is a country steeped in history. Its UNESCO-protected archaeological sites provide an insight into periods of Roman, Arab and European rule and the treasures left behind by each civilization. Here are 10 of the top things to do in Tunisia. Note: At the time of writing, travel warnings had been issued for parts of Tunisia affected by terrorism and political instability. Make sure to check for the latest updates before booking your vacation. The capital of Tunis is the natural place to start your Tunisian adventure. Its origins pre-date the Romans, and over the centuries the city has developed its own unique blend of Arabic, African and European culture. In the French Ville Nouveau area, colonial buildings flank palm-lined avenues and sidewalk cafés serve artisan coffee and pastries. In the medina, authentic souks provide the chance to barter for Arabic crafts and fabrics. As the second-largest museum on the African continent, the Bardo Museum is a particular highlight. Housed in a 19th-century palace, it is a veritable treasure trove of Tunisian history populated by mosaics, sarcophagi and sculptures unearthed from ancient sites located across the country. Further south, the town of El Djem gives visitors the opportunity to relive the grandeur of the Roman Empire. Today’s settlement grew up around the ruins of the Roman city of Thysdrus, once one of the most prosperous settlements in North Africa. Much of the original architecture is now lost—with the exception of the city’s mighty amphitheater. Built to house gladiator shows and chariot races, the amphitheater held 35,000 spectators and was one of the largest in the Empire. Now a UNESCO World Heritage Site, the amphitheater is more intact than the Coliseum in Rome, with two thirds of its triple-arcaded outer walls still standing. Visitors can also see the underground passages and cells that once held the arena’s human and animal combatants. Tunisia’s natural beauty is just as impressive as its storied past. 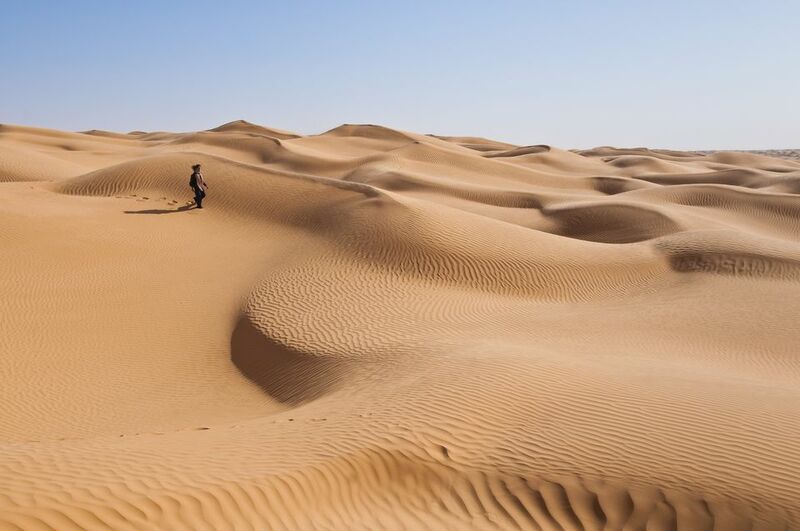 Those wishing to experience the rugged splendor of the Sahara Desert should head for Grand Erg Oriental, a vast dune sea that stretches for approximately 370 miles/600 kilometers between Algeria and Tunisia. The region can be explored on camelback or via a 4x4 safari, with trips lasting anywhere from a few hours to several days. Camping trips are especially rewarding, giving visitors the chance to marvel at unspoiled starscapes and to witness the magnificent colors of sunrise and sunset in the desert. Grand Erg Oriental is famous for its rolling dunes, but in between the endless peaks and valleys of sand one can also find verdant oases, rocky mountains and unexpected wildlife. The centre of Islamic history in Tunisia is Kairouan, a city in the country’s northern inland region. Founded in 670 AD, Kairouan became the principal holy city of the Maghreb region under the Aghlabid dynasty in the 9th century. Today, it is the fourth holiest city of the Muslim faith, and recognized by UNESCO as a crucial stronghold of Arabo-Muslim culture. For visitors, the most rewarding area of Kairouan is the medina. Here, ancient ramparts protect a veritable maze of narrow, winding streets lined with painted houses and bustling souks. Every now and then, the alleyways lead to incredible Islamic monuments ranging from stucco and mosaic-adorned tombs to ornate mosques, the most famous of which is the 7th-century Great Mosque. Located just 12 miles/20 kilometers north of Tunis, the seaside town of Sidi Bou Said was founded to accommodate pilgrims paying homage to the nearby tomb of a Muslim saint. Today, the town is a popular getaway destination for visitors to the capital, offering the chance to unwind overlooking beautiful views of the Gulf of Tunis. Sidi Bou Said is famous for its Greek-style white buildings and distinctive blue-painted doors and trellises. This out-of-place architecture was inspired by Baron Rodolphe d’Erlanger, a French painter and musicologist who settled in Sidi Bou Said in the early 1900s and decorated his palace in the trendsetting white-and-blue style. Visitors can explore the Baron’s magnificent residence before exploring the quaint old town. Now a suburb of Tunis, the ancient city of Carthage was founded in the 9th century BC. It was the capital of the Carthaginian civilization, which posed the only real threat to the early Roman Empire, launching a series of offensives against Rome itself between 264 BC and 146 BC. The last of the Punic Wars saw the destruction of Carthage, which was later rebuilt by the Romans. Although it is not Tunisia’s most impressive archaeological site, it is certainly the most famous. A wander through the suburb reveals the remains of Carthage’s amphitheater, circus, cemeteries and Punic ports, as well as the foundations of the city’s ancient residential quarter. The Baths of Antoninus Pius are particularly famous as the largest public baths outside of Rome. For a more intact insight into Roman life in North Africa, make your way to Bulla Regia, an archaeological site located near the city of Jendouba in the northwest of the country. Under Roman rule, the region flourished because of its ability to produce grain, grapes and olives. This prosperity is evident in the villas at Bulla Regia, which were built underground as a defense against the heat. As a result, their interiors are so well preserved that visitors can walk through the rooms as their owners might once have done and see original artifacts in situ. These include elaborate floor mosaics, which are thought to be amongst the most impressive in North Africa. The haloed sea goddess depicted in the House of Amphitrite is a particular highlight of this incredible site. For a completely different atmosphere, exchange the history of the mainland for the laid-back vibes of Djerba Island. Surrounded by the Gulf of Gabès, Djerba is the largest island in North Africa. Its multicultural residents are famously friendly, and the island itself is a kaleidoscope of whitewashed buildings, sandy beaches and colorful seafood restaurants. Some visitors spend their time relaxing in luxury hotels along the Zone Touristique beachfront, while others venture into the Houmt Souk medina in search of authentic souvenirs. Guellala village is famous for its pottery, an industry that dates back to Roman times. Animal lovers can come face-to-face with over 400 Nile crocodiles at Djerba Explore, or admire wild flamingos on the Ras Rmel peninsula. Tunisia’s most rewarding wildlife experience, however, is to be found at Ichkeul National Park in the far north of the country. Comprising mountains, wetlands and the vast expanse of Lake Ichkeul, the park is UNESCO-protected and renowned for its hiking and birdwatching opportunities. The lake is the last great freshwater lake in a chain that once stretched across North Africa, and as such provides a vital stopping off point for migratory birds en route from Europe and Asia to sub-Saharan Africa. In season, more than 300,000 ducks, geese and coots can be spotted on the lake during a single day, and great flocks of storks and flamingo are common. In addition, the national park also provides a sanctuary for more than 200 animal species and 500 plant species. Despite its allegedly ancient origins, the troglodyte settlement of Matmata was virtually unknown to the outside world until 1967, when extreme floods forced its people to surface from their underground homes. Now, the settlement is a famous destination for Star Wars fans, as the village and its surrounds were used to film scenes from the planet Tatooine. In particular, underground Hotel Sidi Driss acted as Luke Skywalker’s home in the 1977 film Star Wars: Episode IV - A New Hope; and appeared again in the 2002 sequel Star Wars: Episode II - Attack of the Clones. Like all troglodyte homes, it comprises a series of artificial caves cut into the earth around a central pit and connected by subterranean tunnels. It has 20 rooms and a restaurant on-site.